Mauni Amavasya, or Mauna Amavasya, is the no moon day in the Magha month (January – February) as per the traditional Hindu calendar followed in North India. Mauni Amavasya 2019 date is February 4. It is also an important bathing date at during the annual Magh Mela, Magh Snan and during the Ardh (6) and 12 year Kumbh Mela. The word ‘mauna’ or ‘mauni’ means silence and several Hindus keep complete silence on the day. According to Hinduism, ‘Mauna’ (silence) is an essential part of spiritual discipline. Derived from the word muni, a Sanyasi or saint who practices silence, mauna ideally symbolizes a state of oneness with the Self. 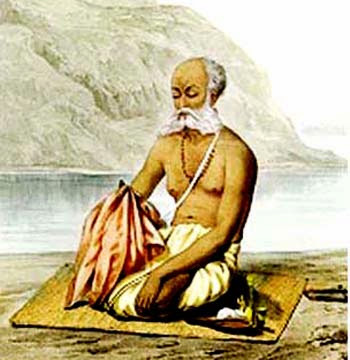 Mauna has also been described by Adi Shankaracharya as one of the three essential attributes of a Sanyasi. In modern day, it was Ramana Maharshi who popularized silence as a medium of spiritual instruction. For him silence was a state beyond speech and thought – it is living without the ego sense. On Mauni Amavasya day, large number of Hindu devotees join Kalpavasis at Sangam in Prayag (Allahabad) and meditate the whole day. Mauni Amavasya is a day of spiritual sadhana – a day to make an attempt to getting into the habit of calming the restless mind. The fast is from sunrise to next day sunrise. Those performing partial fast should consume fruits and raw vegetables. Keep a kalash on a white color cloth. Fill it with water add some til, urad dal, uncooked rice, chandan and flowers. Cover the mouth with coconut and mango leaves. Apply sindoor on coconut. Offer naivedya - preferably a food that one of the ancestors liked. It should later given to a cow. Do donation of clothes, study materials or food to poor people. Keeping a painting of Goddess Lakshmi and light a lamp using cow ghee of one wick. Chant the following mantra 108 times on kamal gatta mala. The mantra will help in achieving the blessing of Goddess Lakshmi. All wealth related problems will be solved. Do abhishek of Shivling with Panchamrut and Bilvas leaves especially during the pradosh period. Chant the mantra 'Om Namah Shivaya' (ऊं नमः शिवायः) 108 times using a Rudraksha Mala. This will help in desire fulfillment. Feed fish for finding relief to all forms of trouble in life. Drop sugar near anthill for sin redemption. Light a lamp using cow ghee in the northeast corner of the house. Use red thread wick. Put a small amount of kesar in the ghee. This will help in achieving peace and progress in life. There will be happiness in life.